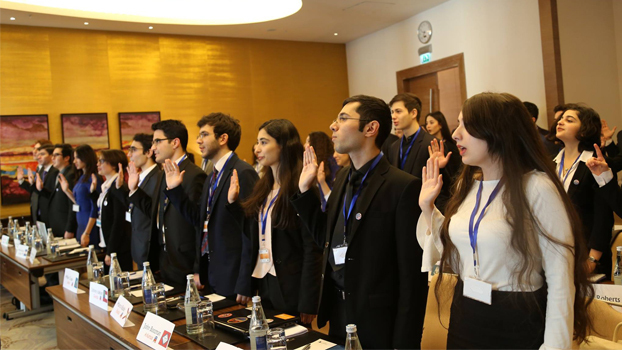 Azerbaijani Exchange Alumni swear in during their two-day Model U.S. Senate exercise. The U.S.-Educated Azerbaijani Alumni Association (AAA) hosted a two-day Model U.S. Senate exercise on February 18 and 19, 2017. Led by AAA board member and YLP alumna Samira Gasimova and FLEX alumnus Elmir Mukhtarov, the mock exercise provided an opportunity for participants to experience the U.S. legislative process while providing education and experience on how a legislative body makes laws. The mock Senate brought together 50 participants from several U.S. exchange programs including Study of the U.S. Institutes (SUSI), Youth Leadership Program (YLP), Future Leaders Exchange (FLEX), Benjamin Franklin Transatlantic Fellows (BFTF), and Global Undergraduate Exchange Program (UGRAD) with non-exchange students from several universities and high schools. Non-exchange participants were drawn from ADA University, Tourism and Management University, Baku State University, Moscow State University Baku Branch, Baku Engineering University (formerly Qafqaz University), Azerbaijan State Oil and Industry University, Azerbaijan State University of Economics, Azerbaijan University of Languages, Khazar University, University of Culture and Fine Arts, and Baku Slavic University as well as several local high schools including Dayanat Lyceum, Haydar Aliyev Lyceum, Zarifa Aliyeva Lyceum, Baku European Lyceum, Dunya School and Istek Lyceum. The Model U.S. Senate conference required participants to assume the role of an existing American Senator and to exercise the Senators responsibility for representing his/her constituents. As Senators, participants discussed the pros and cons of healthcare policy in the U.S., researched a variety of bills, crafted appropriate amendments, represented the people of their States and portrayed the assigned Senator as accurately as possible. In doing so, the Senators proposed legislation, convened committee meetings, held floor debates, and passed several motions relating to healthcare discrimination, public-private partnerships with insurance providers, pre-existing health conditions, and employer provided health insurance benefits. The Model U.S. Senate was a tremendous success at fostering shared values while offering participants a better understanding of democracy’s benefits as well as the complexities inherent to the legislative process. The U.S.-Educated Azerbaijani Alumni Association (AAA) is a non-governmental, non-profit organization that unites alumni of U.S. Department of State exchange programs in Azerbaijan. The AAA was established in October 2003 by a group of US-educated Azerbaijani alumni with the aim of uniting all alumni of Azerbaijan under one umbrella to apply their knowledge and skills to promote mutual understanding, peace, and development. The Model U.S. Senate is yet another example of U.S. Exchange Alumni applying the knowledge and skills acquired from their exchange experience while giving back to their communities.